These are the steps to creating a personal paradise in your very own back yard. At Swan, we believe in dreams. Your dreams! Before you call us - or any pool design company - we encourage you to go outside, relax in your yard, and let your imagination roam free. Make notes for yourself, and discuss them with your family. What kind of environment do you imagine? Romantic evenings with your loved one? Our designers win awards for creativity, but their skill in construction techniques and financial planning is equally impressive. They do more than design your personal paradise - they help you get the most for your money. Your designer will listen to your hopes and dreams, study your space and discuss your options. He or she will sketch out possibilities, and work with you to draw a "vellum" plan with all the elements in place. If you wish, our artists will then draw a three-dimensional perspective and a watercolor painting to help you envision your oasis. For an added touch of luxury, many Swan customers choose to to complement their pool with a built-in spa. Because the spa is filtered and sanitized through the same system as the pool, it is more efficient than a portable spa, and twice as powerful. Your Swan spa can be fitted with soothing, sensuous features like rotating Waterway jets or our unique Swan Hot-Seat™. 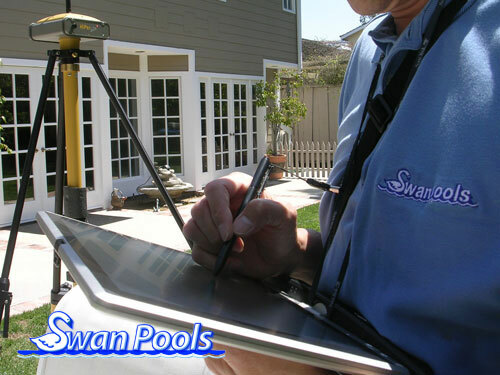 The next visitor to your home will be a Swan Pools field technician. Working from the designer's vellum, the technician ensures that the dimensions for the work of improvement are accurately measured, any potential construction problems are identified, the scope of work is correctly calculated and all government permit requirements are met. After the visit, the Swan Pools Engineering Services group creates the formal computer-aided drawings that guide the Swan construction team. The same drawings are submitted for your city's permit process. 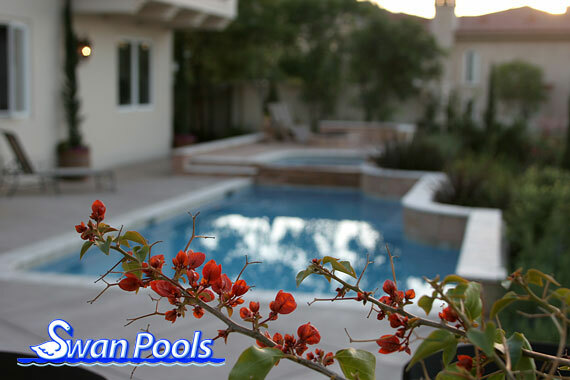 Swan Pools obtains all necessary City permits on your behalf. Once we receive your City permits, we're on to construction! Your aquatic environment will be built in stages, starting with removing the soil and ending with a beautiful finish in the pool interior. Browse through the steps and imagine your dream coming true. 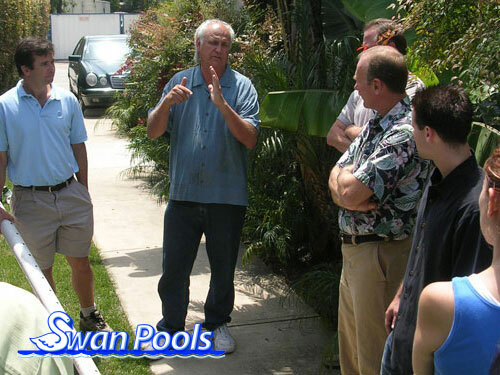 Years ago, Swan Pools raised the bar for pool service companies in California. We were the first company to provide a complete set-up, orientation, and an education program for the pool owner once you have filled the pool with water. Our technician will ensure all equipment is performing properly and that all of the special features are properly set and adjusted. Then they will meet with you and your family, and help you understand how to operate and care for your new oasis, safely and efficiently. Nothing is more important to us than the safety of you, your family, and friends. 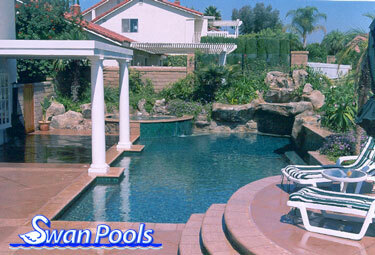 Therefore, Swan Pools are designed and built to the safety standards required by city and state codes. Just the same, all aquatic environments have some risk. We strongly suggest that you study the safety products that are listed in our site AND the links to various other sources of safety information. Please remember, there is NO substitute for careful, consistent, and capable adult supervision of the pool area at all times. No child should ever be left unattended near water. The work is done. Anyone for a swim?